Trevin Parks is willing to work hard for an opportunity that would not otherwise be available. The Hickory High standout point guard has opted to join the Charlotte 49ers men’s basketball team as a walk-on and forgo scholarship offers from Division II schools. “I did have DII offers but ever since I first started playing basketball as a kid, I always saw the North Carolinas and Dukes on TV and I wanted to play on that level,” said Parks, who averaged 22 points and five assists this season for the Red Tornadoes. Parks, 17, has already been accepted into the school and plans to arrive on campus for the start of the first summer school session. He has made visits to campus and had the opportunity to play against junior forward Shamari Spears and junior center Phil Jones, among others. Parks said his likely destination had he not walked on at Charlotte would have been Division II Lenoir-Rhyne. 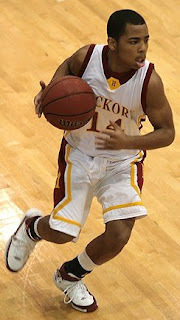 While he spent most of this season as a scorer for Hickory, Parks said he relishes the role of point guard. I'll be happy if he spends his first year just watching and playing with DiJuan. I am happy to see a true point gaurd... not a combo but a true point. WOW! Lutz is really getting some recruits!! When are we ever going to get some quaility players. When will we ever get a true center & away from Juccos & 33% shooting!Live & die by the 3!Be nice to have an inside big game! yeah look at all the true centers in the Atlantic 10. You people are idiots. I would think Braswell, Spears, Bowden, Sherril and Sirin would qualify as "quality players". And wait...none are jucos! Charlotte has to get the best player regardless of how he gets there. We aren't going to lure fast food chain all americans.